Below is a quick review of key findings. One compelling result of this year’s survey is just how comfortable Americans are with sharing their healthcare experiences online. 100% of younger millennials say they find online ratings and reviews “somewhat” to “very” reliable. Our 2018 survey respondents look first to a hospital or clinic’s website as the first source of ratings (34%), with Google (29%) ranked second. Next in popularity are WebMD (18%), Healthgrades (15%) and Facebook (12%). For providers, the survey makes clear which sites they should monitor when it comes to reputation management. 43% chose “wait time” as the most frustrating part of doctor visits.This ranks far ahead of other pain points, such as “cost and payment” and “awaiting lab results,” which both come in at 10%, and “scheduling,” which ranks at 9%. Interestingly, men and women diverge in their opinions of the most important factor in patient care. 45% of men rate “ability to answer all my questions” highest, while 52% of women place “friendly and caring attitude” at the top. 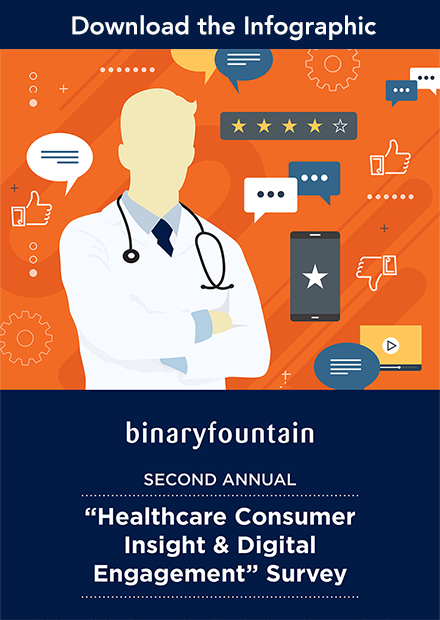 Interested in more findings from our second annual Healthcare Consumer Insight & Digital Engagement survey? Download the free eBook.